This week we begin the week with an artistic experiment in mimicry. 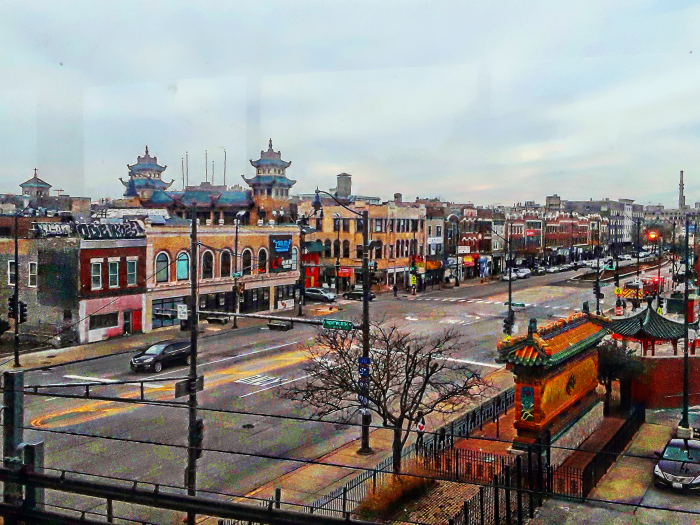 Today’s image started out as a photograph taken from the “L” platform at Cermak/Chinatown on the Red Line. You see the entrance to Chinatown, at the intersection of Cermak Road and S. Wentworth Avenue. I wanted to try to give the picture sort of the look of a vintage postcard, and that took a lot of playing with contrast, saturation, tint, and color balance, and then quite a bit of digital painting to give it the look of a colorized image from a century earlier. I decided not to put in fake tears or weathering on the image. Seemed a bit pointless. I was very happy with the way the final piece turned out. Every Monday in January we will present another image inspired by a scene from our recent trip to Chicago, but each one will be in a drastically different artistic style. Meanwhile, over on The AIR, we debut our slightly-remodeled schedule The Monday Marathon has shrunk from 24 hours to 8. It still kicks off at 7 AM, every Monday, and it still showcases one of our popular music programs, but now it wraps up at 3 PM, to make way for two weekly marathon presentations of the best of two of our regular shows. At 3 PM you can settle in for eight hours of great New Wave music with Sydney’s Big Electric Cat. Then at 11 PM you can spend you overnights with eight hours of the best Progressive Rock of the last half-century on Prognosis. Today’s Monday Maraston features Nigel Pye with Psychedelic Shack. Every day this week we will unveil the new programming schedule for that day on The AIR, right here in PopCult, and if all goes according to plan, we should have new episodes of ALL of our music shows this week.